Bureau of Manpower, Employment and Training (BMET) was established in the year 1976 by the Government of the People’s Republic of Bangladesh as an attached department of the then Ministry of Manpower Development and Social Welfare with specific purpose of meeting the manpower requirement of the country and for export of manpower as well. BMET is engaged for over all planning and implementation of the strategies for proper utilization of manpower of the country. BMET is the most powerful and valuable institute of Bangladesh. It’s help’s us to follow a social life. BMET is to maintain by some social rules. So,we can say BMET creat a great opportunity to the unemployed people. If you want to job in Bureau of Manpower, Employment and Training (BMET),you should submit your application within from 30 January 2019. 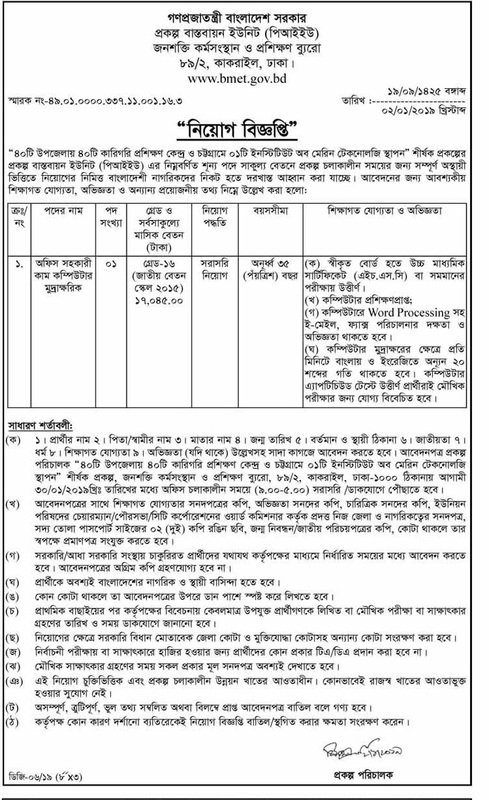 Bureau of Manpower, Employment and Training (BMET) job circular 2016 related all information has been found my website that is bdeverything.com. Bureau of Manpower, Employment and Training (BMET) has been released two job circular that converted to image file for being all the people can easily read this job circular. Bureau of Manpower, Employment and Training (BMET) job circular 2016 has been given bellow.